A year ago we became happy chicken owners. Even though we both grew up having chickens, to be responsible for them is a different story. 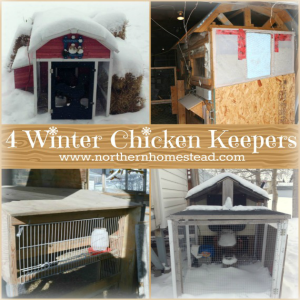 We had to learn all about chicken food, litter, and cold protection in the winter. 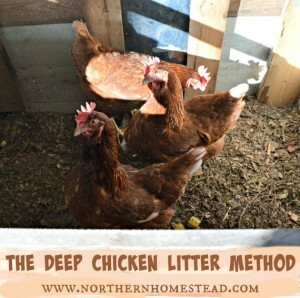 One of the things that we wanted to try, but our parents never did, was the deep chicken litter method. It just sounded too good to be true. Now after a year of doing it, we know that it is true! 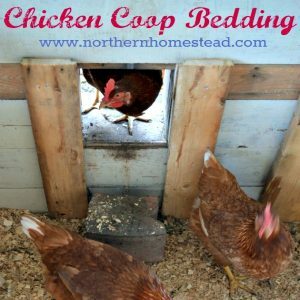 The deep chicken litter method is a no cleaning, deep litter bedding for a stationary chicken coop house. All you do is add litter material. We use wood shavings and leaves accumulating up to a foot of deep litter. 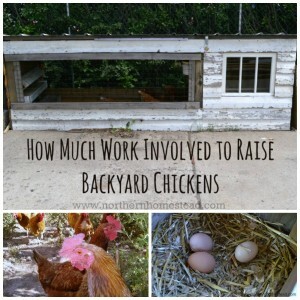 The chickens work it through and it composts on its own. It is dry and not smelly at all. Here’s a side picture of the deep litter. As you see there is ready, dark compost at the bottom, and a mixture of bedding, droppings, and scraps on top. How does the deep litter work? The secret of the deep litter is in something I can’t explain to you. But somehow fungus and bacteria break the material down. To understand, let’s talk about dough for bit. If you leave your cookie dough on a warm day on the kitchen counter, the dough will get sticky and smelly very soon. At the end of the day you will not be able to bake cookies, but will instead have to clean up your kitchen to get rid of the smelly sticky stuff. However, if you leave your sour dough in the same environment, it will rise nicely and at the end of the day you will have an aromatic loaf of bread. The difference is in the bacteria. 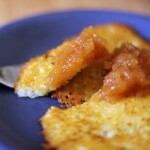 The sour dough bacteria makes the dough rise and not spoil. Same with the deep litter. 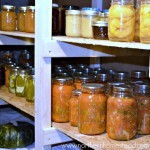 It takes time to get the composting process started, but once it gets going, it works like a charm. 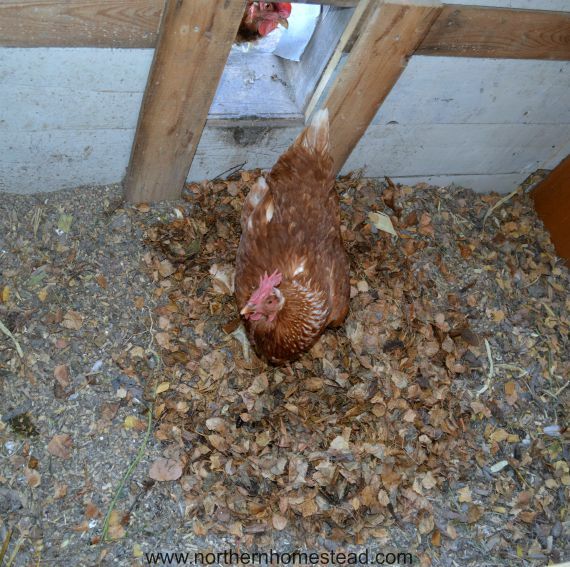 The secret is not to clean, but to feed the chicken coop, by adding natural litter bedding material. 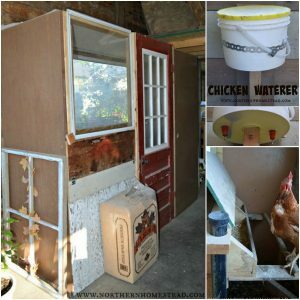 Cleaning the chicken coop would be like throwing away the sourdough starter. Do not do that. 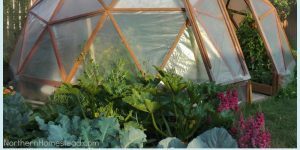 Instead you want to build an active compost pile. 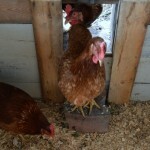 Chickens love compost piles, and if their whole coop is one, it is like a chicken feast on a daily basis. Just like any good compost pile you need carbon materials – the brown and nitrogen material – the green. For brown use dried plant material such as wood chips, hay, straw, dry leaves. The green will be the chicken manure. 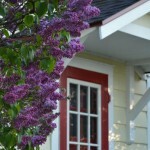 Please note that fresh grass, yard waste, and kitchen scraps are also green material. 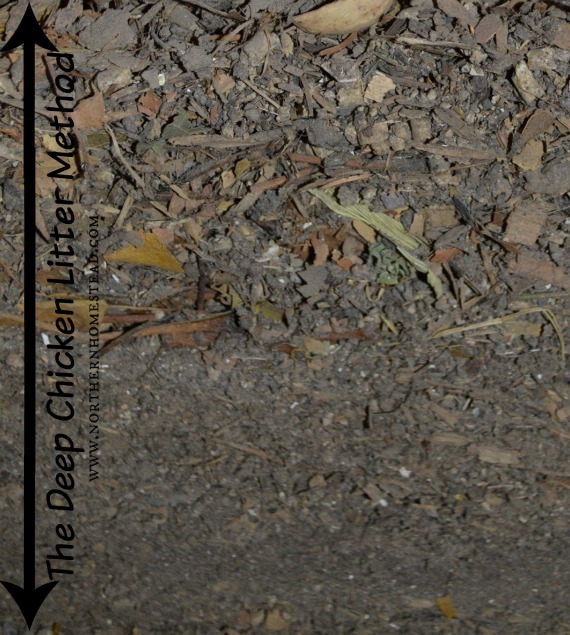 The deep litter should be high in brown material. You want to build the deep litter on a dirt floor so that natural bacteria underneath can get the process started, and also worms can come into the deep litter. Adding some bedding material is all you have to do on a somewhat regular basis. We only have 3 chickens, so I add about a gallon size bag of leaves a month, plus as needed about a hand full wood shavings here and there under their sleeping area, where there are more droppings. I just add litter bedding when I see open, uncovered droppings. That shows me that more is needed. Use your nose. If you smell ammonia, use more bedding material. 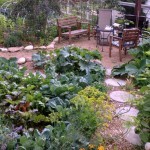 Chicken manure is one of the richest for the garden. The nice thing in the deep litter method is, you have no work to produce the compost. The chickens work it for you. 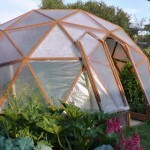 Just remove the upper layer and take the deeper, composted layer for the garden. Put the upper layer back down and continue the deep litter method. Do not take away all the litter. Remember, it is like throwing away your sour dough starter. Do not do that. Open animal droppings smell and attract flies -they just do. There is no way around it except if they aren’t there, when the droppings fall into a mess of litter and get worked in and decompose. That’s the result of a deep litter method. If you still see droppings you need more litter material. The deep litter method makes keeping chickens in town easy. 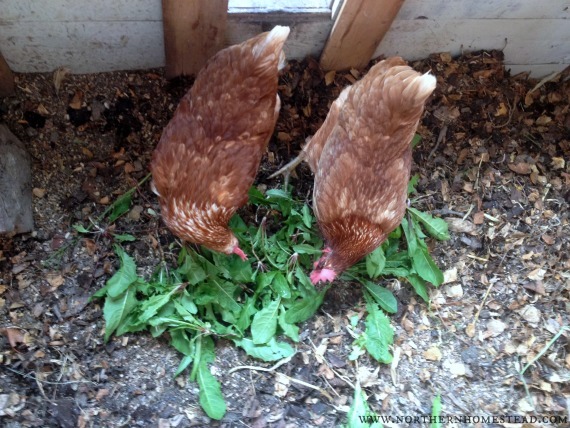 would just add as you do more fresh leaves every week, we had 12 Buff Orpington breed, they get down like geese have, and best for cold weather, had 1 rooster. They would love when the new leaves went in, they just threw them all around. But we cleaned the coop because we had 12. 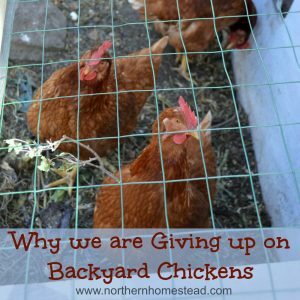 But one thing we did during the winter, I would have their mash in a metal bucket, pour really hot water on it, stir it up, and one of the boys would run it out to the coop, pour into their feeder, so they had warm mash morning and nite. We also grew Comphrey, a beautiful medicinal herb plant, and when we stripped the leaves for feeding to the rabbits and pigs, we would hang the cut plant minus some leaves in their house, and they just loved it. In the spring and summer we could let them out, and they would peck around their area, and when the sun started to go down behind the tall trees, they headed straight for their house. Research comphrey, it is very good for them, and all farm animals. 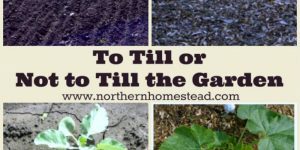 It is a perennial, so make a small patch, and in the fall, cut any back, feed to the chickens, and spread the patch with manure. It will grow great in the spring. Good luck. 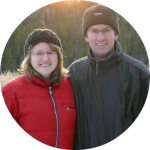 Thank you Marion for sharing with us! Comphrey is a great addition to the homestead garden. I had a hard time finding Comphrey. Apparently it comes in two varieties, True Comphrey and just Comphrey. I ordered seeds for the True Comphrey from Pleasant Valley Seed company in Oregon and only 6 of the 20 seeds germinated. I’m currently waiting for them to seed so I can harvest the little beauties! The Official comfrey spreads more easily than bocking 14. If you plant a bocking 14 in a spot, it will generally stay there. Whereas the official will be more invasive. Once you have an established plant of bocking 14, it is simple to propagate more from the root cuttings. Hope that helps! Interesting information, thank you for sharing will have to look into it. Thank you so much for sharing this, I live in northern Ontario and was wondering if I could implement this up here if/when I ever get my girls! I do not see why you couldn’t. 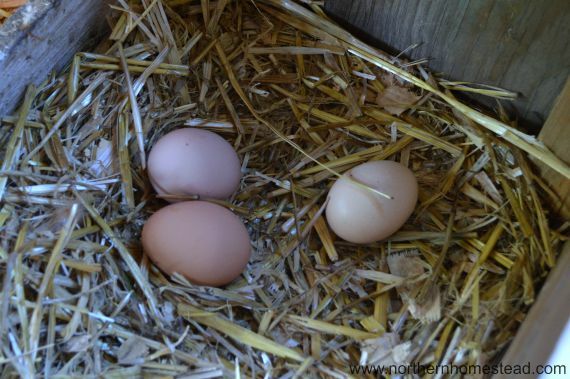 Our chickens do not know much of what winter is like since they are in an insulated building. But even in the building the bedding helps them to keep their feet warm. I would love to use the deep litter method, but our barn floor is wood. I do like to add more straw when I notice their coop getting yucky, instead of just cleaning out the barn, but it never breaks down like you describe. 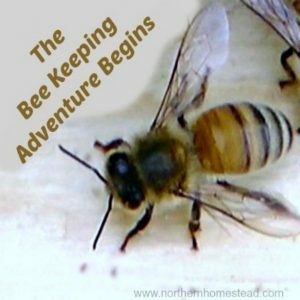 After a few months I have to clean it out as it just piles up too high – especially in the Winter when they are inside the barn nearly all the time. 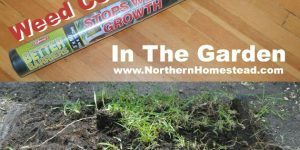 We did the deep litter on a concrete floor too, however, it does not work as well, since there is no moisture and worms coming from underneath. It sounds like you have very happy chickens. Our chicken litter is very dry, wondering if it is humidity what you see, or just the heat raising. What you have is a “hot” compost. This happens when there is higher nitrogen content. Usually one wants this in a compost heap since it speeds up decomposition. Adding “brown” material in a regular compost heap “cools” the breakdown. Presumably adding more bedding would help “cool” it. As far as whether the steam is bad for your chickens, I imagine it would be bad if you had too little ventilation and mold or mildew formed. Also, regular hot compost heaps can get very hot indeed, hot enough to burn.